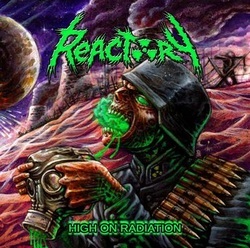 Coming out of one of the thrash wargrounds in Germany, Reactory have a lot of heritage to build off of. They first made a mark on the landscape with a very solid EP in 2013 called Killed By Thrash, now they return with their first full length jugular assault! The band play a strong helping of Teutonic Thrash with a bit of Bay Area thrown in for good measure! To be honest the style is brutal and aggressive, with nary a compromise to be heard! Pounding drums, sweet riffs, gang vocals, angry lyrical matters and a sick thrash album cover, it is all here! Raw, fast, dirty and full speed, that is what you will get here! Tracks such as Shell Shock, Kingdom Of Sin and The Raid will quickly test your body to the limits as you feel the anger and hatred within the music and start to stage dive off your coffee table or mosh against the wall (or whatever you do for fun while listening to your music...I don't judge). Tracks such as Metal Invasion and ABC Warfare are lynchpins on this CD. Fast and brutal with gang vocals and the whole thrash trimmings. Then the band gives you a creative piece such as Orbit Of Theia to show that they can and will do something a bit different here with a slow and somewhat groovy intro into a track that builds slowly into something pretty special! Though the band may not be on the forefront of the thrash movement, they are growing by leaps and bounds and at the rate of growth they could well be one of the rising stars on the scene by the time their next CD hits the streets!